Samsung is making 1TB storage chips for phones. Storage is one word on many wish lists among smartphone users. Last year, there was this comment from Vlad Savov of The Verge who said that—with all the new phone launches and all the company ads nudging us to think we need updates, when the hot air clears, one is left wanting one thing: more storage. Beyond hot new specs, he said he was keen to maximize the storage on his next phone before using it in earnest. "It might not be the sexiest spec in the world, but it's one that just makes life much easier when it's maxed out." Smartphone storage or the lack thereof has continued as a talking point elsewhere but not everyone is pining for more; Android Central had a different take on storage altogether. "It's an argument we have every single year: how much storage in your phone is 'enough' for most people?" Andrew Martonik was in SmH mode. "We've reached the point where people are now questioning the efficacy of having 64GB of storage in an Android phone in 2018. That seems crazy." Martonik argued that "maybe it turns out you don't need more than 64GB right now, or even in the near future. Streaming media apps and cloud-based services have reduced our dependency on internal storage, while the typical size of an app, photo or video file hasn't dramatically increased in the past couple of years." The name of the game was storage management, not more storage, so the argument went. "If you're not willing to do some storage management, nothing short of 500GB will be 'enough' for you. At some point, every phone is going to require you evaluate what to keep and what to delete or store elsewhere." Well, Samsung has good news for those who want more storage nonetheless. Samsung apparently did not believe the effort to bring more storage was crazy. Samsung Electronics' Cheol Choi spoke of a more notebook-like user experience. Paul Lilly in HotHardware: "it's a big deal that Samsung has managed to pass the terabyte threshold. It means that eventually we will see larger capacity smartphones, which is an especially important development on handsets that lack expandable storage. Samsung also envisions the higher storage capacity enabling smartphones to function more like a traditional PC." According to their news release, "Smartphone enthusiasts will soon be able to enjoy storage capacity comparable to a premium notebook PC, without having to pair their phones with additional memory cards." The numbers might leave the storage doubtniks really shaking their heads. Samsung said the new Universal Flash Storage offers 20x more storage than a 64GB internal memory and 10x the speed of a typical microSD card for data-intensive applications. 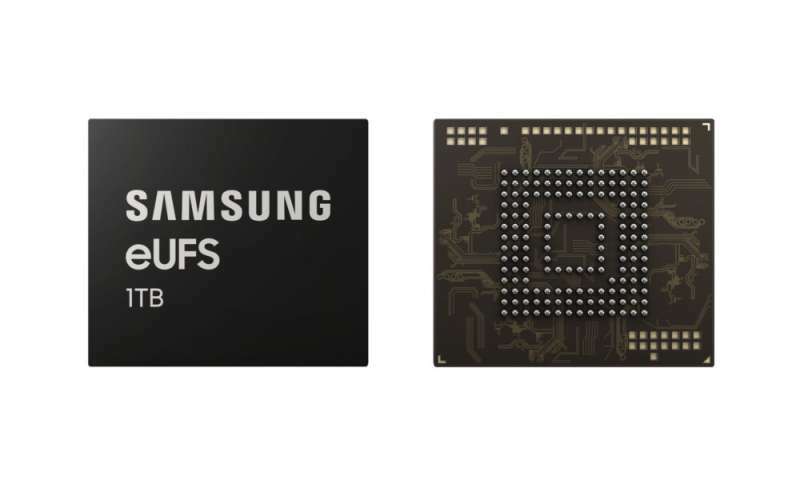 Samsung announced it has already started mass producing the 1TB embedded Universal Flash Storage (eUFS) 2.1, for "next-generation"mobile applications. The eUFS 2.1 is powered by Samsung's fifth-generation V-Nand, the universal flash. SamMobile offered some background: "Samsung's 1TB eUFS 2.1 chip comes just four years after the company launched its first 128GB eUFS solution." It said this eUFS chip has the same package size as the 512GB version that was launched in 2017. "It combines 16 stacked layers of Samsung's 512-gigabit V-NAND flash memory with a new proprietary controller." High random speeds, said SamMobile, will allow for high-speed continuous shooting at 960 frames-per-second and allow users to take full advantage of their devices' multi-camera capabilities. When does all this become available? "Samsung plans to expand the production of its fifth-generation 512Gb V-NAND at its Pyeongtaek plant in Korea throughout the first half of 2019," said Samsung's news release, to address the anticipated demand for the 1TB eUFS from mobile device manufacturers. As for reader reactions to the news, once again the argument for who needs that much storage appears to be open to debate. "I can't imagine wanting 1TB on a phone," said one comment on a site. Another said "I am happy with my Galaxy S9 plus 64 gig model with a SanDisk 512 gig SD card."